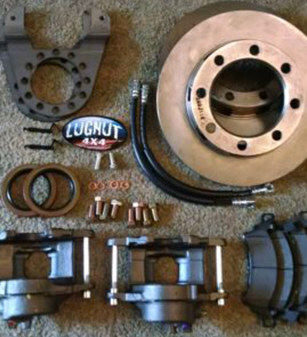 Lugnut4x4 exists because our founder, Shawn Miller, wanted to buy a good, affordable disc brake conversion kit for his truck way back in 2003 and couldn’t find one. So, he figured out how to make his own kit, and today we offer a large selection of disc brake conversion kits for Dana 60 and 14 bolt axles. 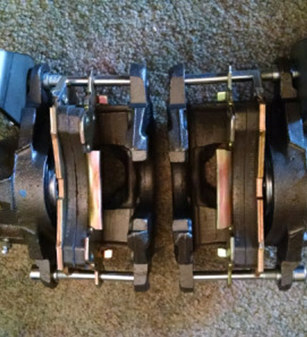 We’re proud to offer the best quality brake conversion kits for Dana 60 and 14 bolt axles at the best pricing available. We make it easy to get the exact kit you need with extensive options on every kit, and if you have a question or a problem, we’re ready and willing to help. We use stainless steel banjo bolts, because regular bolts rust. We use Wagner brake pads instead of cheap imported pads. The most options. Most of our kits have three different calipers to choose from, clockable brackets, different pad options, and slotted rotors are available for most kits too. The best pricing. Our basic disc brake conversion kits start at $315, including priority shipping on US orders. Finally – and most importantly – no one can beat our service. 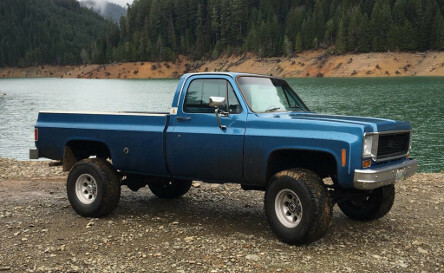 Lugnut4x4 is a small, family business, and questions that aren’t answered in our FAQs are answered by Shawn Miller, the owner and founder. But don’t take our word for it – see what our customers have to say about us on our Reviews page. I bought and installed a kit about a year ago. Best thing I’ve done to my truck so far. I run 46″ XZL Michelin military tires. They weigh 250 pounds apiece. The Lugnut4x4 kit help the breaking tremendously. I also used the Eldorado calipers and when I set the parking break they hold the truck with no problems. Customer service is top notch and shipping was very fast. I bought a brake kit for my 79 F250. Shawn at Lugnut4×4 is an axle wizard! He knew the answer to all my questions, and even helped me with questions I didn’t know to ask…Lugnut4×4 supplied everything I needed in the kit, gave me a list of parts and part numbers for my technical journal, and is around anytime to answer my calls and help me with any question I have. Very helpful and top notch customer service!. Shawn is amazing to work with. I blew the seal out of one of my parking brake calipers in Moab. Called him up and he warranted it out. Also used his kit on a FJ with one tons. Great company to work with. Will definitely use his products again and tell everyone how awesome he is. Thanks again Shawn! About 2003 I started getting into 4-wheeling. I had a ’78 Bronco I was building. I upgraded the axles to a Dana 70 rear and 8 lug Dana 44 front. I also did every other brake upgrade I could find on the internet including a different master cylinder and booster. I never was happy with the brakes. I could adjust the rear brakes and it would be OK for awhile, but not for long. I felt like I had to push the pedal through the floor to get it to stop when on the trails. 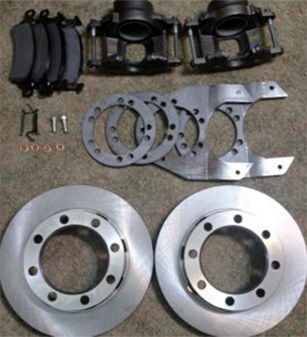 Finally I ordered a disc brake kit for the rear and all my brake problems went away. I paid over $400 for that conversion. I thought that was way too high, so I started putting together my own kits.